Welcome To Competitive Edge Metal Roofing, Home of the most affordable Prices in the Metal and Shingle Roofing Installation Business today! Simply put we are the most affordable with our prices often being half of the normal rate of a lot of companies. Our prices for a new metal roof are often cheaper or not much more than the price of a standard Shingle roof! Do not pay too much for your roof when we are willing to do it for a fair price, will negotiate with you if money is tight, as well as provide a 10 year guarantee on labor which no other company is doing! Most people receive such high prices from other companies that they are left believing they cannot afford a Metal roof and settle for a shingle roof or simple repair, or they simply pay too much to a company who is going to charge extra for materials and overcharge on labor and installation. Most of the time when people receive our price they are very relieved and excited to finally realize they will be able to get the roof of their dreams much cheaper than they had though before, that look of relief is the reason I got into this business. Their are many reasons our customers and followers are calling us the best up and coming business in the industry. From our guaranteed lowest prices, to our superior installation techniques. Our dedication to customer satisfaction is just one more characteristic that sets us apart from the other guys. Here at Competitive Edge Metal Roofing we are highly dedicated to customer satisfaction above all else, when you hire us you’ll have a Roofing Company as well as a friend for life. We provide answers to those complicated roofing and Metal Roofing questions you have always wondered about. We want you to be comfortable asking us anything you would like to know about your new Metal Roof or Shingle Roof. Call today and find out why homeowners in North Carolina recommend us for all of their Roofing needs. FREE GUTTER CLEANING INCLUDED WITH MOST ESTIMATES! AND YES ESTIMATES ARE FREE CALL TODAY 336-504-2776. AVERAGE TOTAL ROOF COST WILL VARY DEPENDING ON ROOF. WE GUARANTEE TO BEAT ANY COMPETITORS PRICE AND ALL OF OUR LABOR COMES WITH A 10 YEAR GUARANTEE / WARRANTY, METAL HAS A 40 YEAR MANUFACTURERS WARRANTY. NAME YOUR OWN PRICE NOW ONLY WITH COMPETITIVE EDGE METAL ROOFING!!! NAME YOUR OWN PRICE!!! Competitive Edge is proud to announce the Addition of name your own price to our company, Simply give us a call and request an estimate, let us know what type of budget you have for the project or price you think is fair and we will do what we can to meet the price or come to an agreement that you are satisfied with! We are very proud to be the only company in the business offering this! We are now accepting all major credit cards in addition to cash and check. We are highly dedicated to customer satisfaction and are very proud to offer the BEST Metal Roofing and Shingle Prices in the Roofing business today, with many of our estimates being half to a third of the price of the other guys, we GUARANTEE TO BEAT OUR COMPETITORS PRICES on Metal Roofing as well as Shingle Roofing. This is just of one of the many reasons customers choose us to install their new Custom Metal and Shingle roofs. When we come to give an estimate we don’t just give an estimated cost like the other guys who give you one price, then when you get the bill its significantly higher, we give you an actual guaranteed price of what your new Roof by Competitive Edge is going to cost! When you call (336)504-2776 you will reach the owner of Competitive Edge Timmy Weaver, knowledgable and respectable, never an automated machine that will annoy you until it finally lets you leave a message. We will help you to achieve the goal of obtaining that wonderful new Metal Roof or any other Roof that you have always dreamt of. 95% OF ROOFS WE INSTALL ARE DONE FOR 1 $ PER SQUARE FOOT IN LABOR COSTS, AS WELL AS $1 PER SQUARE FOOT IN MATERIAL COSTS! ! Noone can compete with that price! We Install Metal Cheaper than Shingles ! With 14+ years of experience in the Roofing business we have installed any kind of roof you can imagine, from Metal Roofing, Shingle Roofs, Clay Tile Roofs to Rubber Roofs, Metal Shake Shingles and Mule Hide Roofing. We spare no details into making sure your new Beautiful Custom Roof by Competitive Edge Metal Roofing looks exactly the way it should and works exactly the way that a New Roof should work in every way. Including No leaks anywhere and an excellent visual experience in your eyes and in your friends and neighbors eyes. We know exactly how to install everything to the manufacturers expectations so that everything is covered by its warranty exactly like it should be. We offer Superior installation by highly skilled and trained professionals who have been in the business for years and skip no details when providing exceptional Metal Roofing Work and any other Roofing work.. We install metal Cheaper than shingles, we are generally 1/3 to 1/2 the price of our competitors! Get an estimate from us and you’ll see why our customers prefer us to other companies! We offer the same warranties and guarantees as larger companies at a fraction of the cost. Competitive Edge Metal Roofing Company offers a 40 year manufacturers warranty on all of the Metal Roofing we install. We also install all Roofing Material to the manufacturers expectations so that we make sure all warranties are in-tact in case the need ever arises to need it! We also offer a guarantee on all of the Roofing Labor we perform, if you have any problems with your roof (which we doubt you will) we will be back within 48 hours to fix it GUARANTEED. That is one powerful warranty! and we can afford to do that because we know that our guys know what they’re doing and will install with the greatest of care and attention to details so that there are not problems with your new roof by Competitive Edge Metal Roofing, we are very committed to our work being right the first time! Specializing in Metal Roofing ! 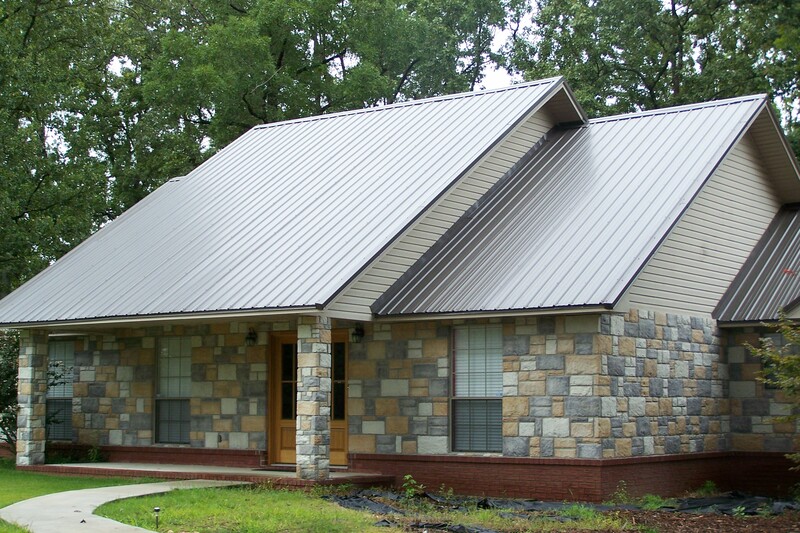 We are very proud of our specialty being Metal Roofing, we simply love doing it! We pay high attention to detail when installing all of our roofs, but especially our Metal Roofs. It’s just something about a new Metal Roof Shining in the sun on a beautiful day that makes us wake up happy in the morning and going to a job that we love to do. When Timothy Weaver JR was a young man his father Timmy Weaver SR always told him “find a job that you love doing son” if you ask him today has he fulfilled that dream he will tell you “absolutely” he wouldn’t trade this job for anything in the world. We take care of every aspect of your new Metal Roof From Panels, Screws, new pipe boots and, trim, to high quality Underlayment and Snow Guards if you would like them installed on your New Metal Roof. When we tear a roof off we make sure we take care of any bad wood as well as cut the plywood back at the ridge if it is too tight to allow for proper ventilation, and take out all of the old nails so they don’t get in the way in the future. Our Metal Roofing will be one solid piece, top to bottom, all the way across your roof, we will never piece anything to make it “easier” like some other companies who are less experienced, one more reason why homeowners choose Competitive Edge Metal Roofing as their Roofing Contractor and, friend for Life. We also offer excellent incentives for you to choose us as your premier Roofing Installer just a couple things include, Charitable donations, Refer-a-Friend, and who can forget our Cheapest Prices Guaranteed as well as our specials on new Roofs and Senior Citizens Discounts, and Military Discounts. Competitive Edge has some of the best if not THE BEST incentives in the business as well as Better warranties and Guarantees in The Roofing and Metal Roofing Business today! Competitive Edge Metal Roofing offers one of the most wide-spread coverage areas of any Roofing Company in North Carolina and Virginia to date. We provide Beautiful Roofing work for any homeowner with any budget in the following areas and are not limited to these areas! If you would like us to service you in your area simply ask and you shall receive! If you do not see your area it doesn’t mean we don’t service it, just ask and we will come! Timmy Weaver will answer any questions you may have as well as schedule your appointment for your free no obligation estimate!